Condensate (water or condensed steam) reduces the quality of the steam but is too high value to discard. Condensate can contain up to 20% of the energy required to make the steam in the boiler. Maximize the amount of condensate that is returned to the boiler to save both energy and water treatment chemicals. The value of the condensate varies with its pressure and temperature which depends on the operating pressure of the steam system. If boiler feedwater is 60F, and the condensate is 212F, then each pound of condensate contains at least 162 BTUs (212 – 60 = 152); if the boiler is operating at 80% efficiency, then it represents 190 BTUs (122/80%). Condensate under pressure and above 212F can be flashed to steam for additional energy value/recovery. 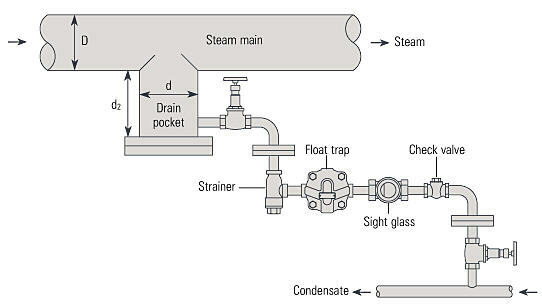 Condensate is collected at each point of steam use and in long steam pipe runs. 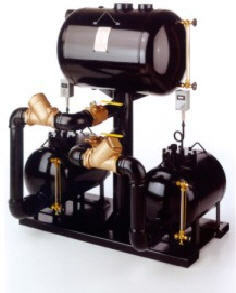 It is then pumped back to the boiler using steam pressure or electric-operated pumps. Due to the velocity at which steam and condensate flows in a steam line, it is important to have the drip leg adequate in size. This is to allow the condensate to flow “into” instead of “over” a drip leg, as its purpose is to remove all condensate in the line. Remember condensate will reduce the quality of the steam in a system. Too small a drip leg is similar to having a golf ball pass “over” the center of the cup due to the speed at which it is traveling. Steam main drip legs should be sized at the same diameter of the pipe, up to 4″, on mains above 4″ it should be one half the diameter but never less than 4″. Use “Eccentric” reducer couplings when downsizing the pipe. Never use “Concentric” couplings as this will allow condensate to settle in the line. Ensure that the condensate piping is adequately sized. Condensate piping has to accommodate two-phase flow B liquid and vapor. The vapor portion of the condensate stream is more voluminous than the liquid portion. In general, condensate piping must be sized to handle the flash and blow-through steam rather than just the liquid portion. Condensate piping that is sized for the liquid portion only will be grossly undersized.